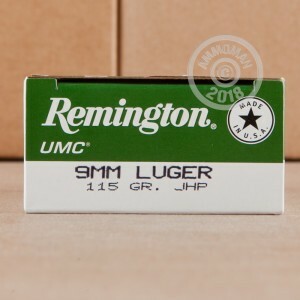 Remington UMC ammunition is a perfect choice for quality range training. 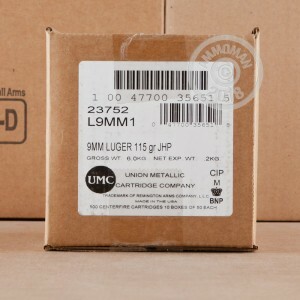 These 9mm rounds are loaded into boxer primed, new production brass cases that are re-loadable. 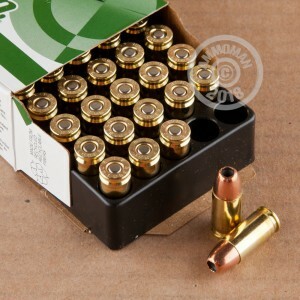 Each projectile in this box of 50 is a 115 grain Jacketed Hollow Point that leaves the barrel at 1,135 feet per second. Remington acquired Union Metallic Cartridge Company in 1912 and the brand name Remington-UMC was born. Since then, the Remington UMC line of ammunition has aimed to provide shooters with a blend of affordability and performance. Remington loads these rounds with factory fresh brass and Kleanbore primers paired with MC or JHP projectiles. Buy more and save more! At AmmoMan.com all orders over $99 qualify for free shipping! Great ammo very happy with this one, I used it in my Beretta 92fs and I had no problem at all. It is a little expensive but really great ammo is a must have.